After that terrible storm, it was such a pleasure to see the sun rays out again. 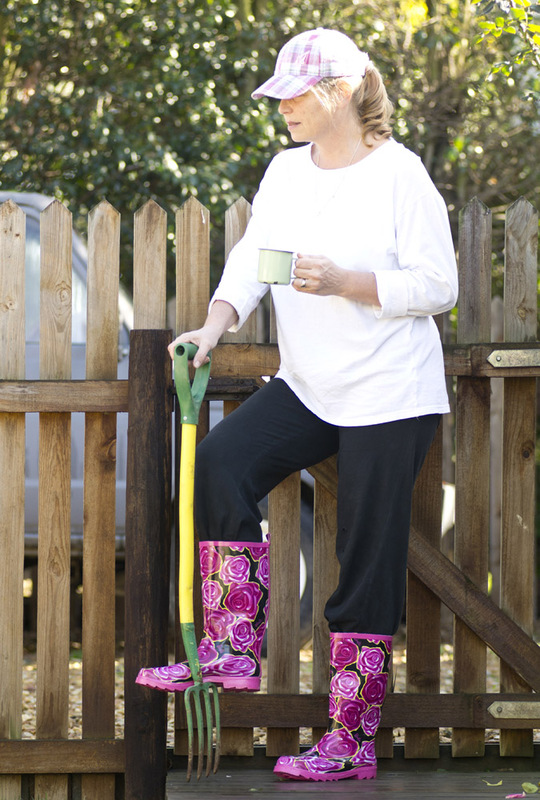 I hurried into the garden – with my Barbie Gum Boots and a mug of coffee – and took note of what needed my urgent attention over the weekend. 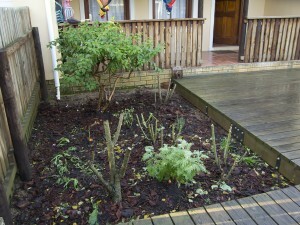 I just recovered from a bout of flu, so I had to select my garden task wisely! So my important task was to prune the rose bushes. We are now in mid-winter so it is time! I usually ask the plants for forgiveness before I start cutting anything off them. So with pruning secateurs I started removing all those thorny branches. I always knew I had to prune them back hard, but never had any formal training nor the confidence. I did, however, follow the instructions from the DVD series from The Gardener Magazine and I felt more confident and knowledgeable this time. Ludwig, from Ludwig’s Roses, was the guest speaker on the DVD series and a huge big AHA moment came to me when I saw how he pruned the roses – from the light prune to a hard prune. 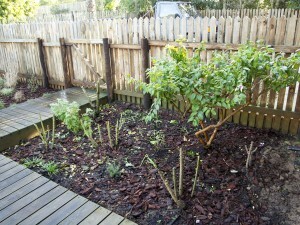 This time I wanted to prune – HARD! This is where the decision-making dilemma starts. The BIG question is – What branches are superfluous? 1. Hard pruning means we decide that about 75% of the upper branches are superfluous from a 2m tall rose bush, and we select 3 to 4 basal stems. cut them down to 50cm and remove all the other inside growth. 2. 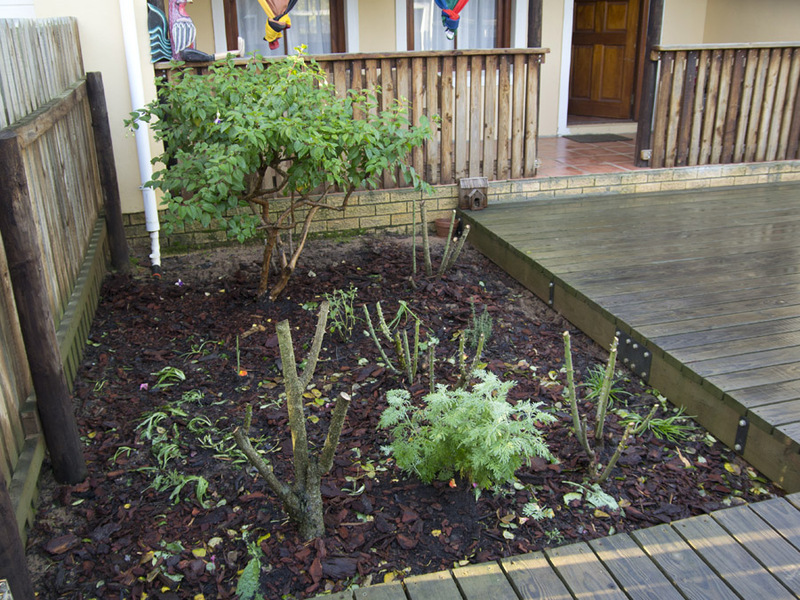 Medium hard pruning entails removal 50% superfluous wood by selecting 4 to 5 basal stems or branches cutting them down to about 70 cm and leaving some of shortened side stems. 3. With light pruning one removes about 30% of the wood. Final cut – not much left! I believe I have succeeded in doing this job right! Let’s see how the roses fare! Now I can enjoy my Fuchsias this winter – they are looking really beautiful and with the extra light, I hope they will flourish! 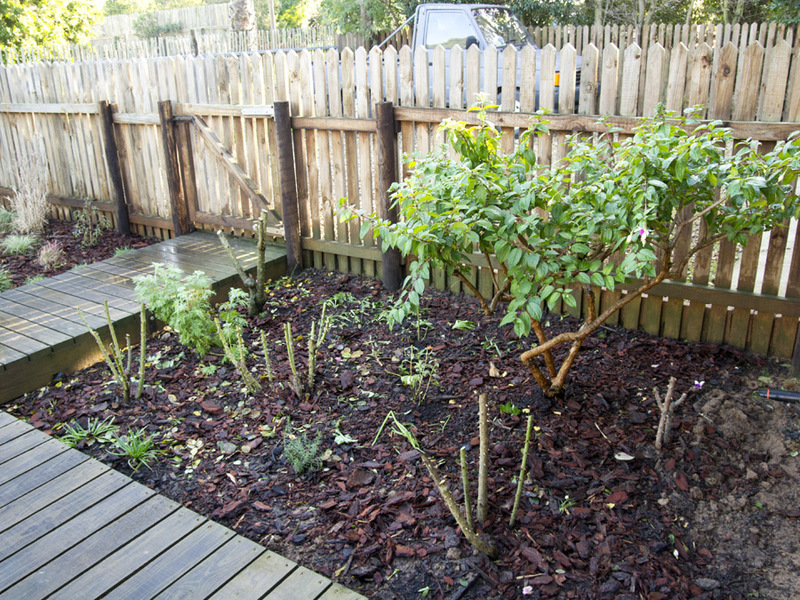 That’s exactly what I wanted – a neat rose bed. 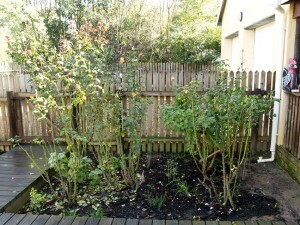 My roses grow wild to nearly 2m high so I would prefer a neater, smaller display this spring! 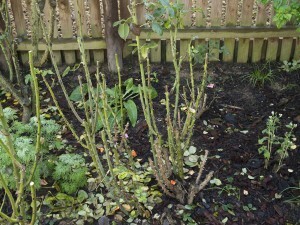 Well, I accidentally hard pruned my red cascade rose the other day. I meant to just trim it off the top of the dog house but ended up cutting the wrong branch, and suddenly the whole top came off! I will see how it likes being so severely pruned right in the middle of the hottest summer. I’m telling myself not to worry. This has been an amazing rose, and I am looking forward to new growth and a new flush of blooms in the next few weeks. I hope! Oh dear – that happened to me too once – and I lost that stem! But the rose bush flourished, so I would not worry! Let me know how your rose gets along. One of Ludwig’s newsletters he told his grandson about pruning. 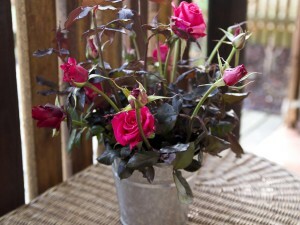 Turned around and the little boy had hardpruned the rose in the nearest pot. Well taught by granpa, that rose flourished, just as granpa said it would. Still got lots of flowers here, I prune nearer the end of July. What a lovely story! I guess the grandson didn’t have the fear that we all have in our heart when we think of hard pruning! I normally leave my roses for end on July, but did it different this year! Hi Barbie – Wow! You are braver than I! I’ve watched that DVD twice, bought a book and still I am nervous to prune my roses. You’ll have to supervise or help me when I’m ready to do mine. Sure my friend! Roses are tougher than we think! You don’t have to prune as hard as I have! Rose pruning can be a torment. 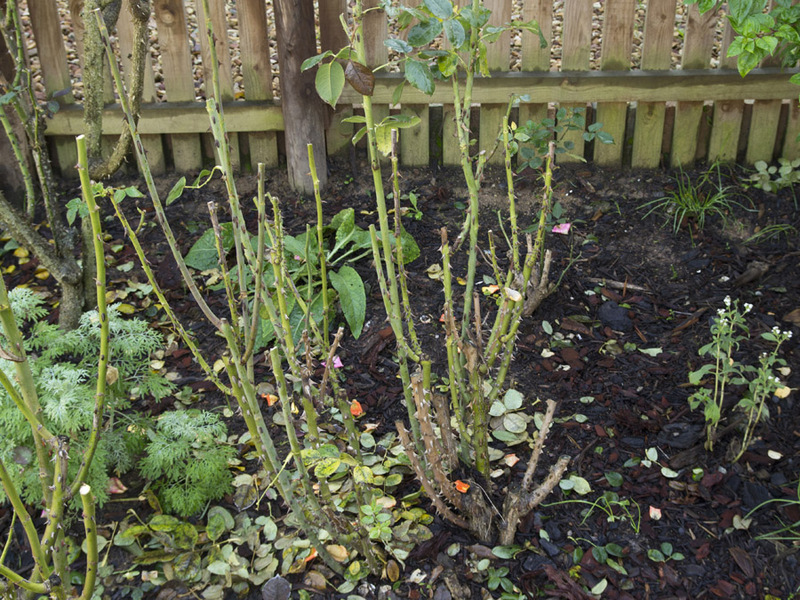 Do this, don’t do that, prune HT Roses hard, slightly different method for Floribundas, and information varies depending in which country you may live. 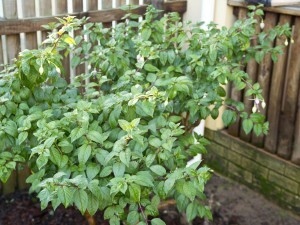 As for pruning just above an outward facing bud, well the buds seldom in a place where you should prune to. An experiment was conducted here a few years ago. One group of Roses were pruned in what they say is the proper manner and another lot of identical ones were hacked back with shears.The flowering and shape of the plants by mid Summer were equal. Now I wouldn’t recommend hacking back, perhaps it may not be so wise in the long term, but it does make you think. Thank you Alistair, I have always wondered what would happen if you did a trial like that! I would be worried that I would totally kill a plant if I prune hard, and I see that it is not the case. So, I am going to monitor these rose bushes that never fail to delight me.